LISBON, Portugal — Portugal drew with Serbia 1-1 in qualifying for the 2020 European Championship on Monday, with Cristiano Ronaldo playing only half an hour before being substituted with a right leg injury. 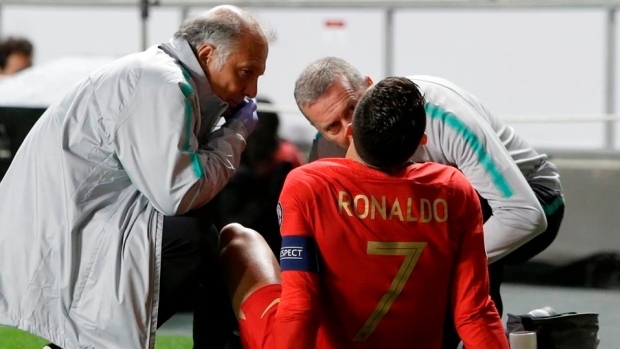 In his second game with the national team since the World Cup, Ronaldo had to leave before halftime after pulling a muscle while sprinting to try to reach a long pass at the Stadium of Light in Lisbon. Team doctors said Ronaldo will undergo tests, but the star forward was not too concerned. Serbia opened the scoring with a penalty kick converted by Dusan Tadic in the seventh minute, and Danilo Pereira equalized for the hosts with a powerful long-range shot before halftime. The defending European champions loudly complained when the officiating crew reversed a 73rd-minute penalty call after Andre Silva's header touched the hand of a defender inside the area. The referee appeared to signal the penalty but backtracked after talking with the linesman. "It was a clear penalty," said Ronaldo, who stayed to cheer from the bench for the rest of the match. "I had the chance to talk to the referee and he admitted that it was a mistake." Portugal coach Fernando Santos said Polish referee Szymon Marciniak also apologized to him after the match. "We looked at the video and there was no doubt," Santos said. "You can't let someone who is 40 metres away make the call for you." In the other Group B match, Ukraine won at Luxembourg 2-1 to take the group lead by one point. Luxembourg stayed with three points, one more than Portugal. Serbia, with a game in hand, has one point. Portugal had already been held by Ukraine to a home draw in its first qualifying match on Friday. "The two draws are not favourable," Santos said. "But this team has the talent and the quality to win the next two away matches." Ronaldo limped toward the sideline and signalled to the bench to request a substitution. He sat by the sideline and removed the captain's armband before doctors arrived and treated what appeared to be his right hamstring. Ronaldo, who had already been treated for a bleeding nose earlier in the match, walked back to the bench on his own after being replaced by Pizzi Fernandes. Just like in the scoreless draw against Ukraine, Portugal created numerous scoring opportunities but failed to capitalize. Serbia goalkeeper Marko Dmitrovic made several good saves to keep Portugal from finding the net early on. Serbia also had its chances, with Tadic and Aleksandar Mitrovic constantly threatening in attack. Portugal continued being held by Dmitrovic's saves until Pereira broke through with a spectacular long-range shot that curled into the net near the end of the first half. Serbia visits Ukraine for its second qualifier on June 7, while Portugal returns to qualifying action on Sept. 7 with a game at Serbia.